Greetings to all writers of all ages! My name is Callie Blair, and I am one of the administrators on a Facebook page known as Writers Coming Together to Write. 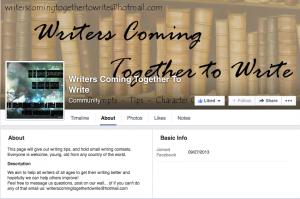 The page was created by Janaya Borst on September 27th, 2013, and she as well as two other administrators, myself included, began a community for fellow writers of all ages. This is a general description, but a more in depth look shows we are a very busy and creative group of administrators. We all work together to create and schedule posts that challenge our followers’ minds, giving them prompts, creating little games in which their characters can be active in, hosting contests, and offering questions to make them think deeper about their story lines. We also offer advice from our own experiences and encourage our “likers” to post frequently, offering their own advice or inspirational photos and news that we repost and reply to. We have gained 488 likes since the page began and now have seven administrators from around the world, including myself. Recently, we came up with the idea of having a large scale activity to help assist those who are taking part of Camp NaNoWriMo this July. (For those of you who do not know what this is, it’s a writing challenge that takes place over the course of a month in which you set your own word count goal and work to achieve it before the 31st of July has passed.) Thus began our collaboration of “How to Survive Camp NaNoWriMo and Every Day Writing,” which has been composed by all of the administrators as well as various special guests, Laura Thomas included. Throughout the month of July, we will be posting every day on the page, offering tips and motivation. We will host Word Wars, in which participants spend a certain length of time writing as much and as quickly as they can without worrying about editing, and various prompts designed specifically to help everyone achieve what they wish to this month for their writing. Our special guests will give professional advice, and almost every one of the administrators will be taking part in the Camp NaNoWriMo challenge themselves. We encourage everyone reading this to give our page a like, check out and interact with our survival guide, and participate in Camp NaNoWriMo alongside us. We would love to have you as part of the family! On behalf of all of us on Writers Coming Together to Write, I would like to thank Laura Thomas for the special opportunity to write this article. We are all incredibly thankful! I was so shocked to discover one of my favourite Facebook pages posting on one of my favourite websites! I’ve ‘liked’ Writers Coming Together to Write since…forever. Great post, and I can’t wait to see what’s coming up on the page in the months to come!